. writing . reading . creativity . art . simplicity . books . culture . 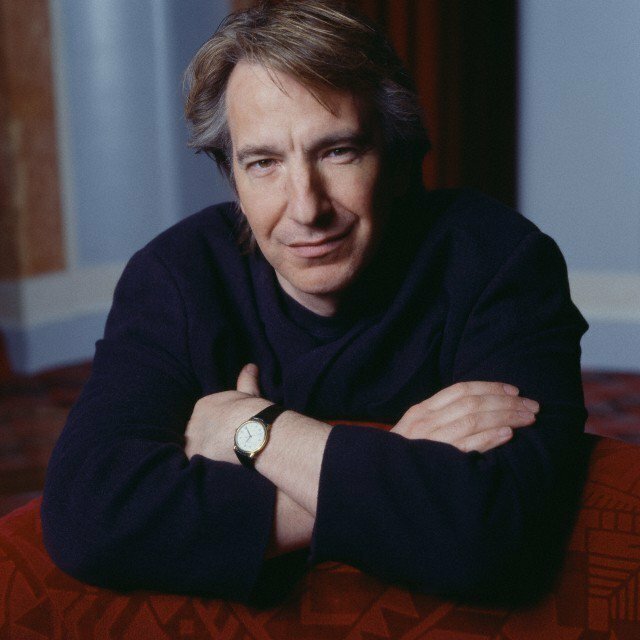 Most of us have by now heard the news that British actor Alan Rickman passed away on January 14, 2016 — a week ago today. He appeared in some wonderful plays & movies, portrayed many unforgettable and iconic roles, and will be greatly missed by fans of all ages. 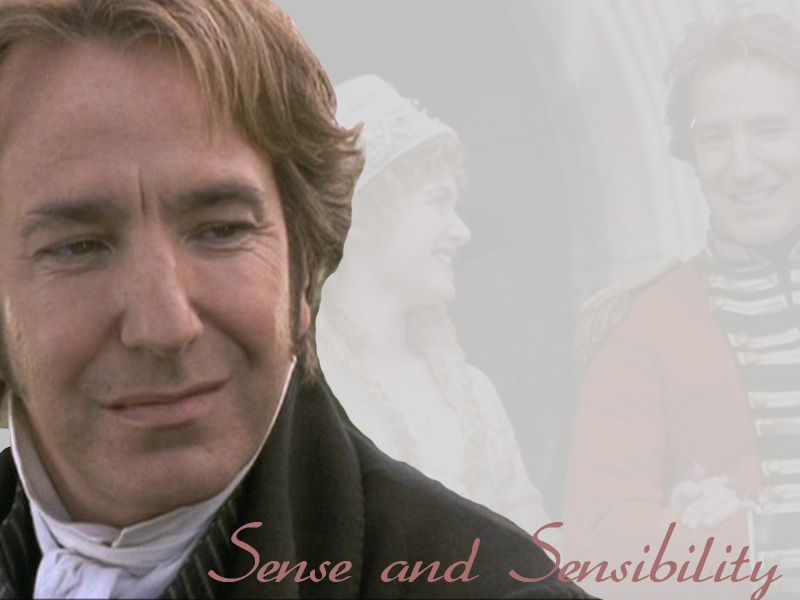 My favorite Alan Rickman movies/roles: Die Hard (1988), Truly Madly Deeply (1990), Sense & Sensibility (1995), Galaxy Quest (1999), Bottleshock (2008), and, of course, his portrayal of Prof. Severus Snape in the Harry Potter movies (2001-2011). And who could forget his appearance in Victoria Wood’s BBC Christmas Special: “Plots & Proposals” (2000)? His movie persona also helped me personally in a major writing project that I just finished. Back in 2008 I began writing a novel. The working title was the veterinary medical thriller. Later, the working title became Play Dead. It is now set to be published as The Keys of Death. 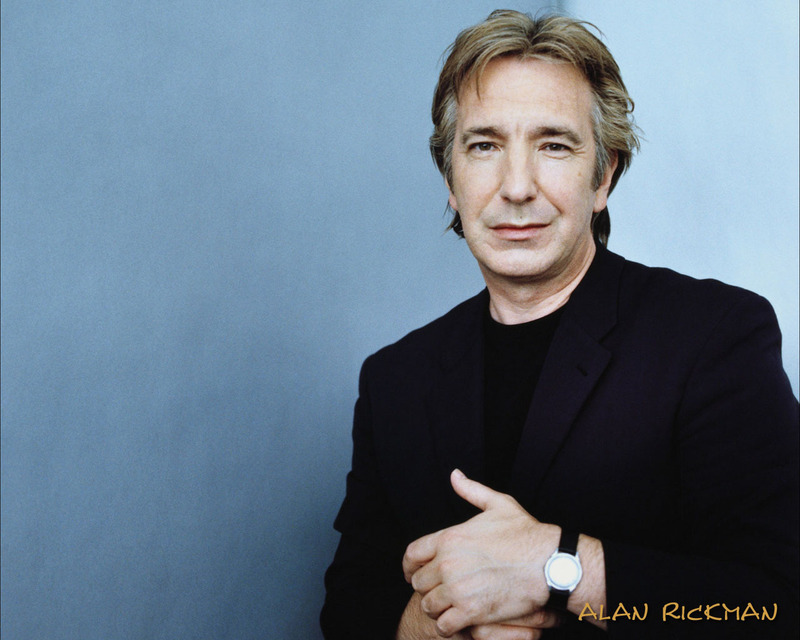 Most of the time I do not have a specific person in mind when I build a character, but when writing The Keys of Death I based one character specifically on Alan Rickman. 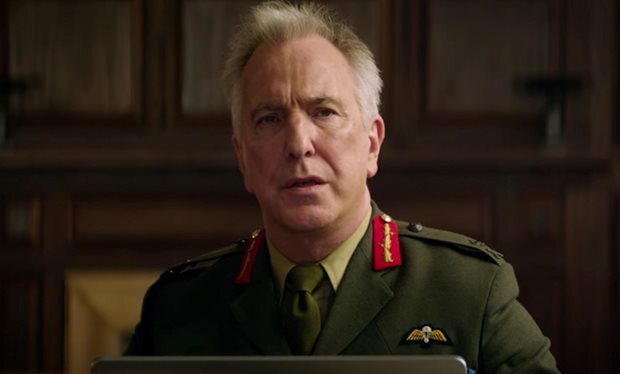 When I wrote this character’s dialogue and described his mannerisms, I vividly pictured Rickman in my mind acting the role and heard that one-of-a-kind voice in my head. As a fiction author, it really helped me to bring this character to life in my mind and hopefully on the page. The Keys of Death will be available for purchase this weekend on Amazon, then hopefully at other online venues once I make the file conversions. 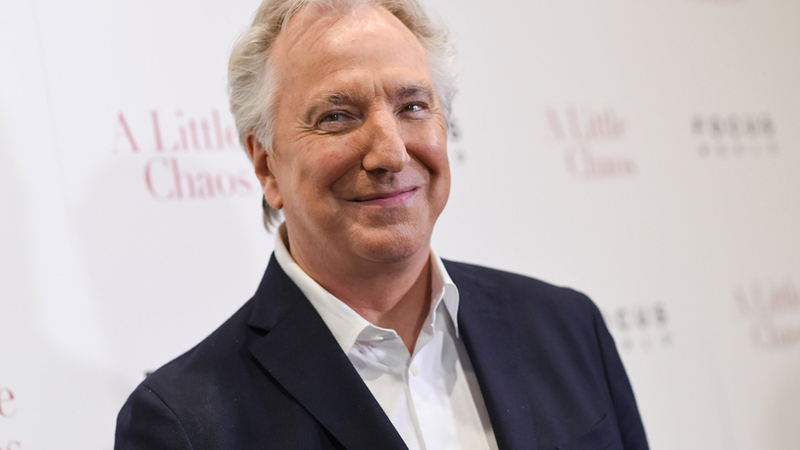 This article is interesting, because I suspect Alan Rickman and possibly the other filmmakers knew something about Snape’s back story and true character as early as The Prisoner of Azkaban. Near the end of that movie, many of the characters are gathered around the base of the Whomping Willow and Lupin turns into a werewolf. The werewolf turns menacingly toward the three children and Snape. 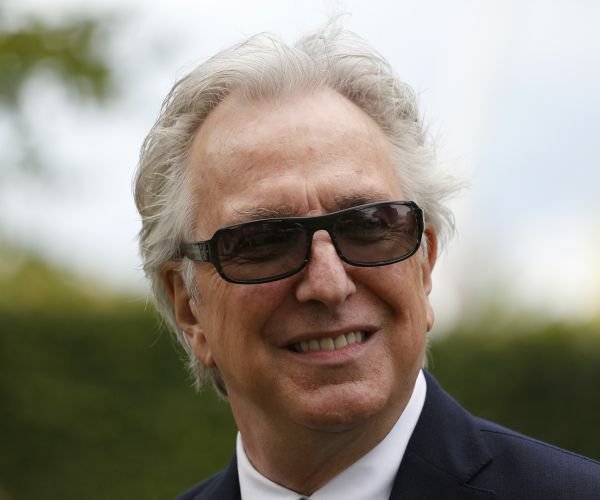 Snape shoves the children behind him and spreads out his arms to protect them. 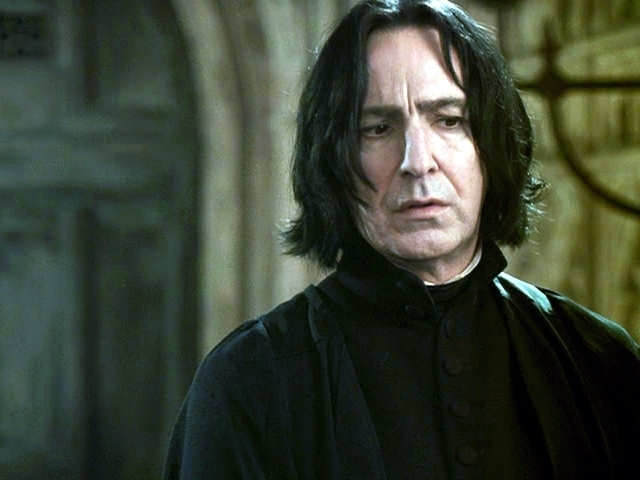 It’s a quick moment, subtly portrayed, but I’ve always loved it because it betrays that Snape’s “swooping about the castle like an overgrown bat” is his persona, but his true self is good and protective. Getting close to a clean copy of the ms of my upcoming novel, The Keys of Death!! Woo hoo! Note that there will be no arts & crafts projects in the published version of this novel. Sorry. Cannot write much at the moment. Am putting finishing touches on final draft of novel hopefully to be released in September and simultaneously binge reading C.S. Lewis in preparation for class I’m teaching beginning mid-October. Please send chocolate. That is all. Tonight (June 25, 2015) I read a chapter from Startling Figures, volume 1 at the No Shush Salon, the monthly open mic night at the Clarendon Hills Public Library. The featured author tonight was local Chicago writer Brendan Detzner, author of the short story collection Scarce Resources whose other short fiction has appeared in the story anthologies Exigencies, Book of Dead Things, and One Buck Horror, volume 5, as well as various magazines. I bartered with Brendan — a copy of Startling Figures for a copy of Book of Dead Things. Hopefully it won’t be too scary for me. Clarendon Hills librarian Jeanine Vaughn runs the No Shush Salon. She read from her novel-in-progress and was also handing out free notebooks: nice hardcover ones, the kind with a snappy elastic ribbon to keep it closed. 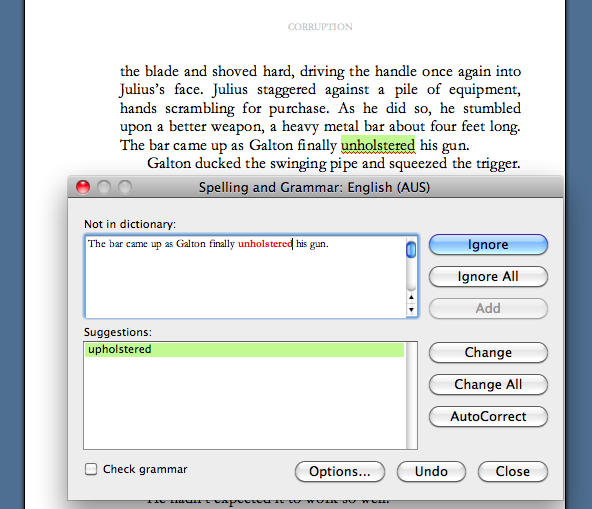 No author in his or her right mind would say “no” to that! So I got to hang out with some amazing writers, got two “freebies,” and before I left I checked out The Hobbit, part 3: The Battle of Five Armies. Here’s a challenge: say “No Shush Salon” five times fast. I can barely say it one time slow! 🙂 Thanks, Jeanine, for putting together this chance for local authors to share their work! Bad Grammar Theater meets every 3rd Friday at Powell’s Books (University Village location: 1218 S. Halsted, Chicago, on the campus of the University of Illinois Chicago) from 6 pm to 9 pm. Upcoming dates: July 17th, August 21st, September 18th. I’ve been to several PLR launch parties, and this one was by far the most “chill.” In past years they’ve featured live bands, a silent auction fundraiser, an artist creating an original work of art during the party, award-winning short dramas, but this time they skipped all that and focused on the work. About a dozen people read at the microphone, and easels of featured artwork were on display. 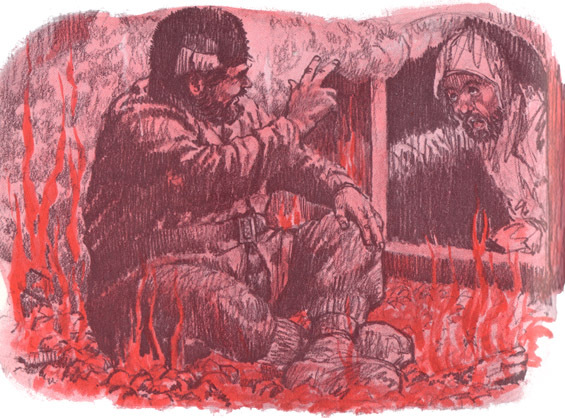 Instead of reading the piece that appears in the issue, I read the first chapter from the third story in Startling Figures, vol. 1. 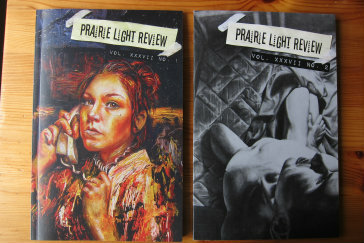 The visual appearance of this year’s Prairie Light Review is truly stunning. I applaud the production editor, Monica Dinh, who designed the two issues this year. The presentation of the visual and written art is beautiful. She used white pages with black text and black pages with white text — whichever showcased the visual art the best. 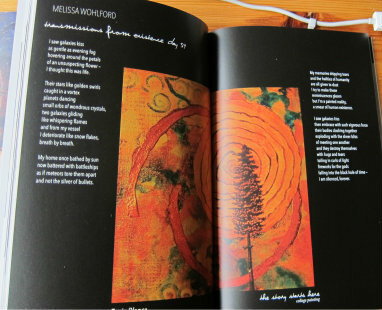 In a blind selection process, Monica’s oil painting “When the Sounds Stop” was also chosen as the cover of the Fall 2014 issue (the one on the left in the photo at the top of this post). 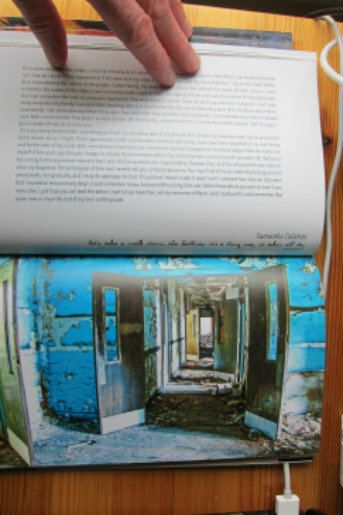 So, I’m very pleased and proud to have my work featured in this exceptional student-run journal of art and literature! I want to acknowledge the fine work of Editor-in-Chief German Sosa, Marketing Editors Charlie Burrows and Jake Barber, copy editor Julia Andersen (whose lovely poem “Tiny Hands” appears in the spring issue), associate editor Karen F. Forslin-Bojnansky, assistant editors Earnest Bickerstaff, Myra Brygette Lopez, and Angela Ferdinardo, and faculty advisor Trina Sotirakopulos. 2000 copies were printed, and if you’re in the western Chicago suburbs and you happen to be in Glen Ellyn, you can stop by the College of DuPage and pick up your free copy of PLR Spring 2015. They usually have stacks of them around about, especially outside the library, the bookstore, the MacAnnich and the various lounges. in honor of NBC Nightly News anchorman Brian Williams, it’s Delusions of Grandeur Week! In honor of NBC Nightly News anchorman Brian Williams, it’s Delusions of Grandeur Week at Clare T. Walker.com!! Do you have an amazing or heroic deed you wish you’d done? Do you wish your life was more exciting than it is? 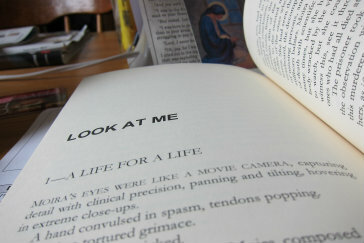 Do you have a rather bland tale that you can embellish beyond all believability in order to draw attention to yourself? You’ll get your chance — read on! Brian Williams’ credibility crisis reminds me of a fictional genre oft-neglected these days: the tall tale. 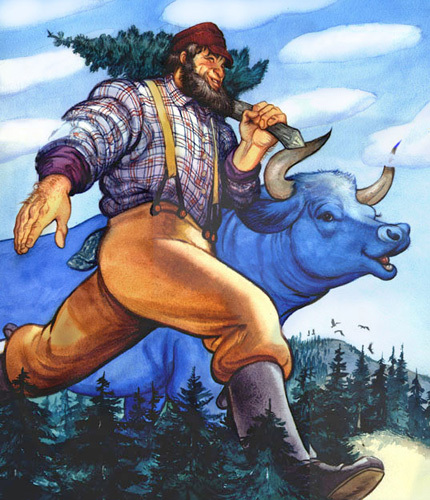 Famous tall tales from American literature and folklore include Paul Bunyan and Babe the Blue Ox, Pecos Bill, Johnny Appleseed, John Henry, and Casey Jones. In Ireland and Scotland we have Finn MacCool, who, among other great feats, built the Giant’s Causeway. And who can forget Robert Service’s hero from the Great White North, Sam McGee? Tall tales are lots of fun to read, and even more fun to write, especially when you’re lampooning a public figure who’s made a doofus of himself on the national stage. 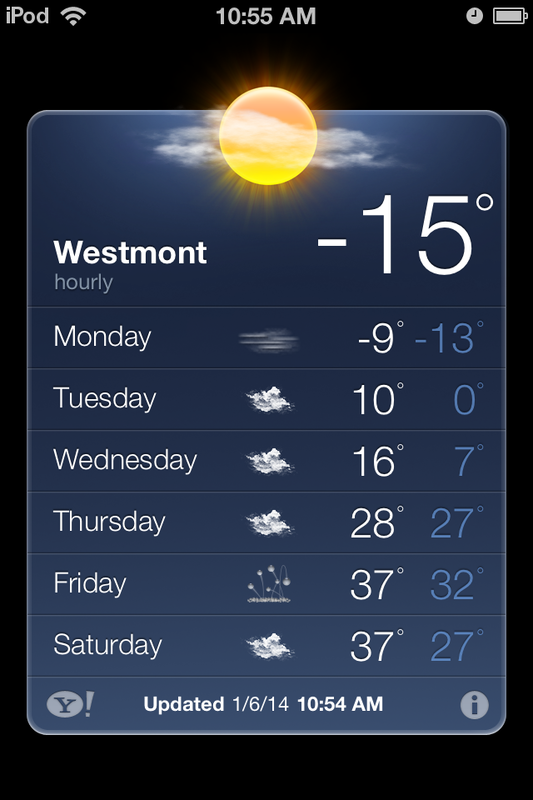 Just last week, I was shoveling my driveway after the record-setting snowfall here in the Midwest. It snowed for 28 days straight, and I had to shovel sideways from my porch for about one hundred yards before I could finally shovel up. It took me 7 days to reach the surface, and when I finally emerged, I realized I had miscalculated my shoveling angle and must have been heading east on a pretty steep diagonal, because I found myself standing right outside the windows of the Sky Deck of Willis Tower downtown. Oops! 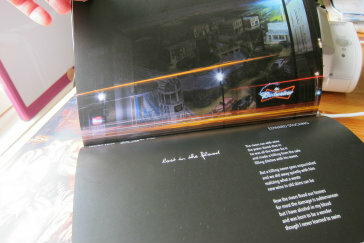 But it turned out to be a happy mistake, because the entire Sky Deck was engulfed in flame! I used my handy diamond glass cutter (which I just happened to have with me) to cut a neat, circular hole in the window. I then had everyone on the Sky Deck luge down the snow chute I had constructed. Within a few moments, everyone had reached the safety of my front porch. Fortunately, I had just made a monster batch of chili in my 4 dozen crockpots, so I was able to feed everyone while they waited for their loved ones to come get them. Did you enjoy this article? Fill in the box and I’ll send you updates automatically! Startling Figures – excellent reviews! I am so pleased that people are enjoying these stories! I had a blast writing them! If you haven’t read them yet, they are still available at amazon.com in both paperback and Kindle editions. 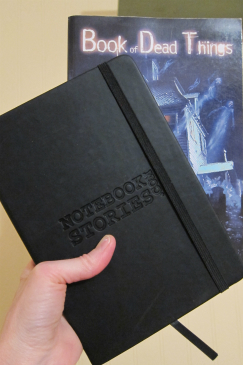 Since you ask — I’ve rummaged through my heap of ideas, and chosen 3 stories for Volume 2. I am in the “plotting” stage now. In case you’re wondering, I sometimes plot with index cards, using 1 card per scene, like they do for movies and TV episodes. Sometimes I plot on an 8.5 x 11 inch sheet of paper divided into quadrants, one for each “act” of the story, with a line or two per scene. Sometimes I plot on the back of an envelope. (I’m not even kidding. That’s how I plotted “Tooth and Nail,” the first story in Startling Figures). So, I will keep you informed. If you want to keep super up-to-date, fill in the box below with your email address and you’ll be among the first to know! Sign in here to receive updates on upcoming books, including Volume 2 of Startling Figures! So instead of spending my day off wrapped in a warm, fleecy blanket sipping cups of steaming, hot herbal tea, I went with 3 students who are members of SPLANCHNICS, a young adult fiction-writing workshop I lead. Where did we go? To see the wardrobe, of course. Not just any wardrobe, but The Wardrobe, as in the one built by C.S. 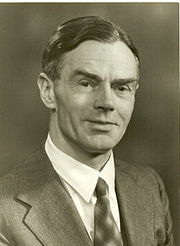 Lewis’s grandfather, kept in the home Lewis grew up in, and later moved to his home near Oxford University and kept in the front hall. The one that inspired The Lion, the Witch and the Wardrobe. 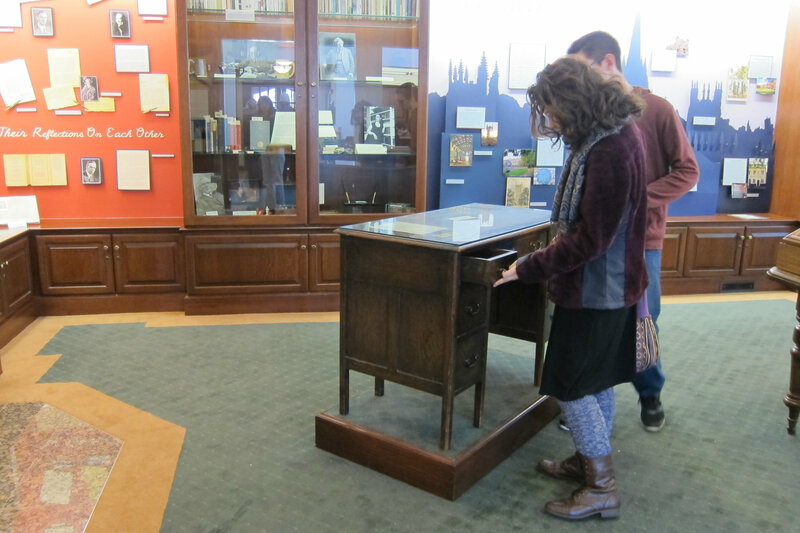 And we also saw the very desk upon which J.R.R. 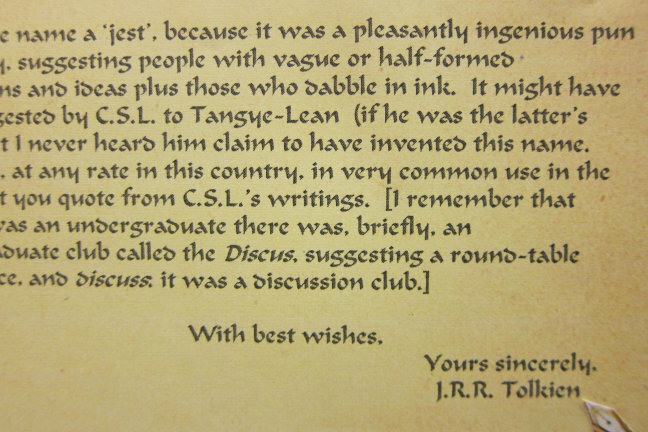 Tolkien wrote, edited, typed and illustrated The Hobbit. 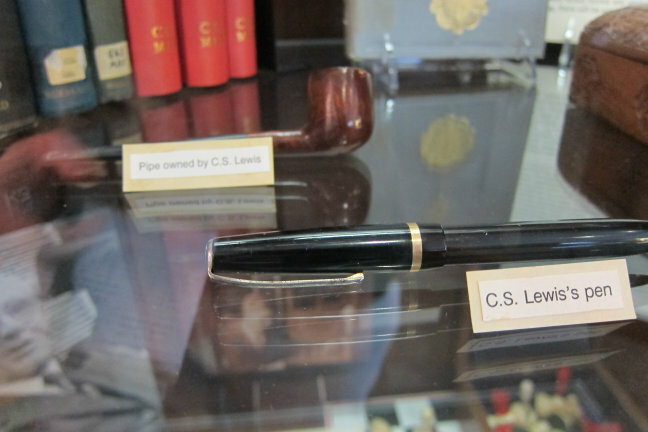 These wonderful objects of literary memorabilia are in the permanent collection of the Marion E. Wade Center, on the campus of Wheaton College in Wheaton, Illinois. The collection began in the 1950s, when Dr. Clyde S. Kilby, a professor of English at Wheaton College, began corresponding with C.S. Lewis. 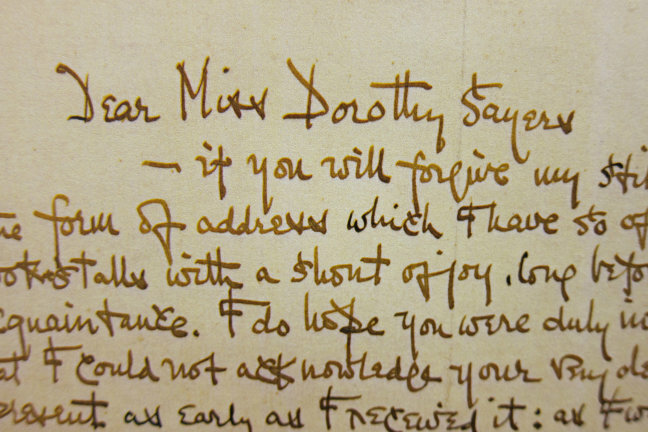 They wrote each other letters right up until Lewis’s death in 1963. By that time, Kilby was also friends with Tolkien, and actually assisted in the compilation and editing of The Silmarillion. 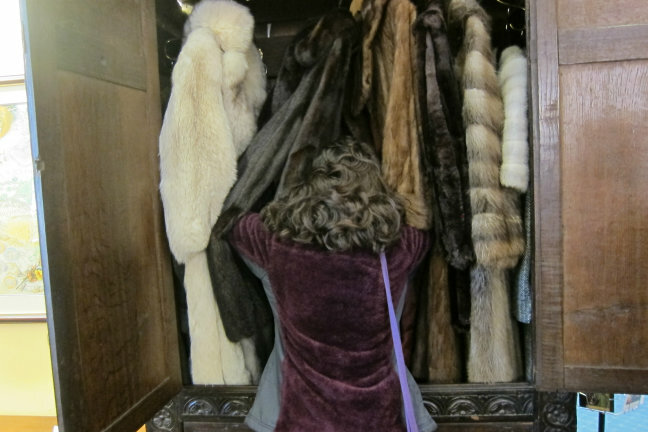 A young person trying to get to Narnia through the wardrobe! 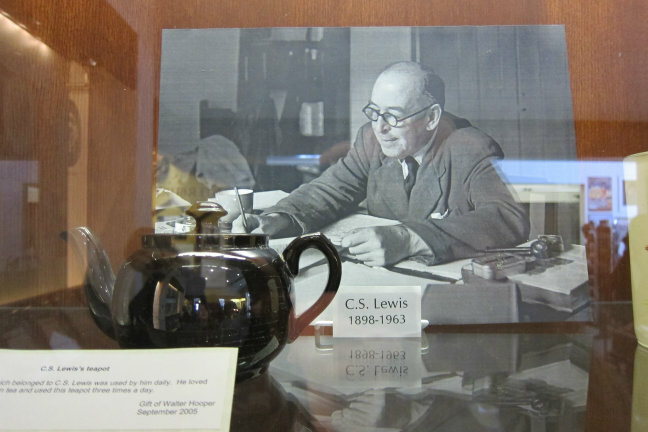 The Center also has one of the largest collections of “Chestertonia,” (G.K. Chesterton stuff), and all sorts of things owned by Tolkien and Sayers and the other authors. 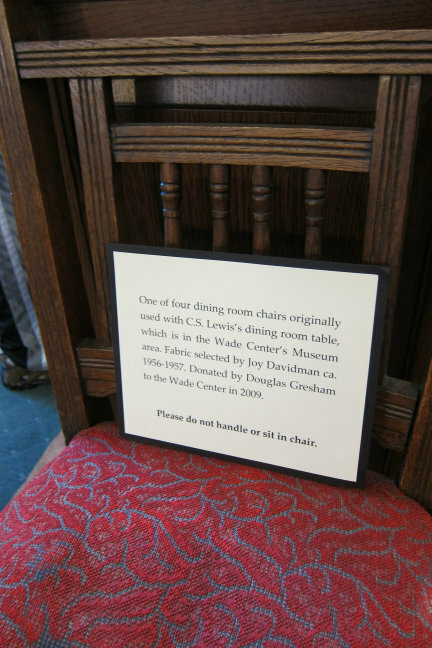 The Kilby Reading Room, however, is the real treasure of the Wade Center. They have at least one copy of every book written by the seven authors, vast scholarship by and about them, hundreds of letters, original manuscripts, inscribed and annotated books from the authors’ personal libraries—it’s a vast collection. 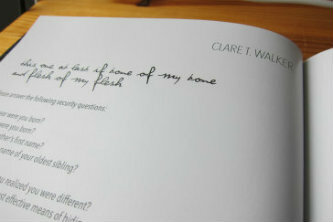 I was so entranced by the authors’ handwritten letters that I bought myself a fountain pen. When I got home, I started reading The Silmarillion, and rewatched the special features documentaries about Tolkien in my Lord of the Rings DVDs. 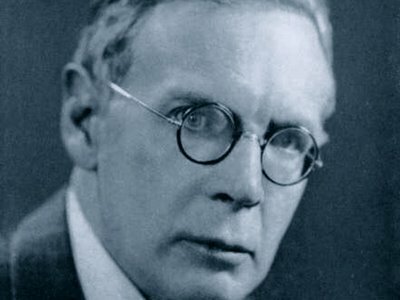 Not well-known by the general public, but his writing and scholarship had an enormous influence on both Lewis and Tolkien. 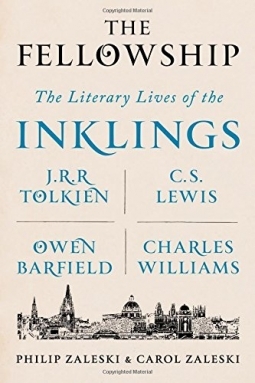 He was one of The Inklings, the informal literary society of which Lewis, Tolkien, and Charles Williams were also members. The Lion, the Witch, and the Wardrobe is dedicated to Barfield’s daughter, Lucy. 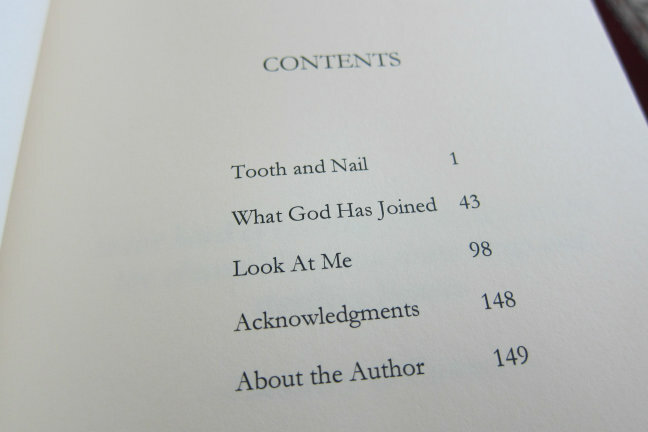 Prolific author of fiction, essays, political and social commentary, poetry, Christian apologetics, you name it. For many years, he gave very popular talks on BBC Radio. He’s famous for wittily turning common sayings on their heads. (“If a thing is worth doing, it’s worth doing badly.”) His most well-known works include the Father Brown mysteries, The Man Who Was Thursday, and Orthodoxy. His book The Everlasting Man influenced C.S. Lewis profoundly. 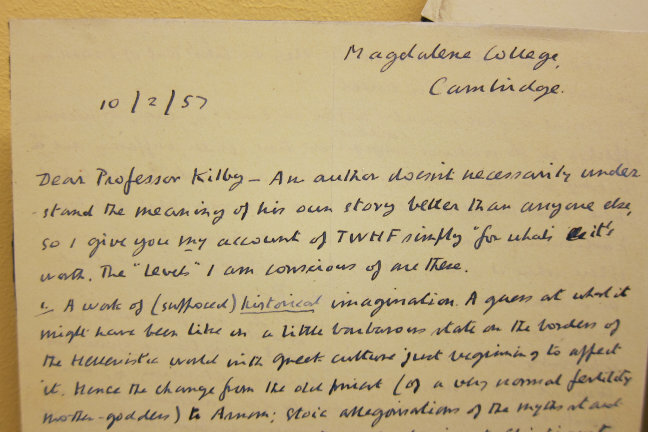 The author whose works inspired Professor Kilby to start the collection at Wheaton College. 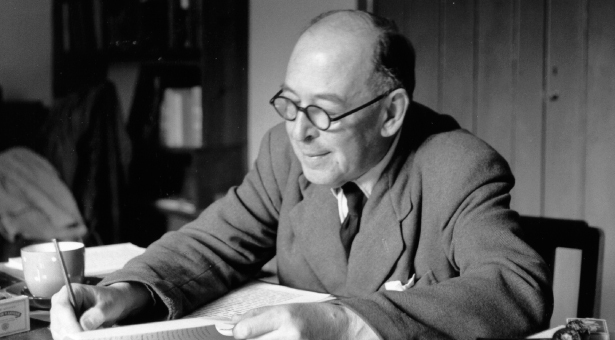 He was a professor of English literature at Oxford University, and, like Chesterton, wrote Christian apologetics (Mere Christianity, The Screwtape Letterx, others) and gave well-received talks and radio addresses. 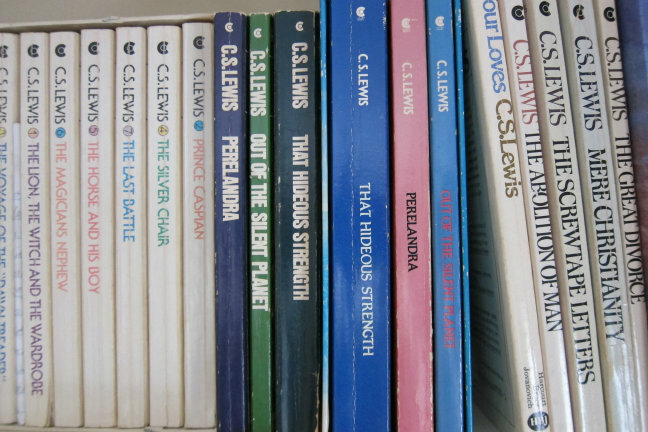 His fiction includes The Chronicles of Narnia, a trilogy of science fiction novels known as the Space Trilogy, and an excellent fantasy novel called Till We Have Faces. 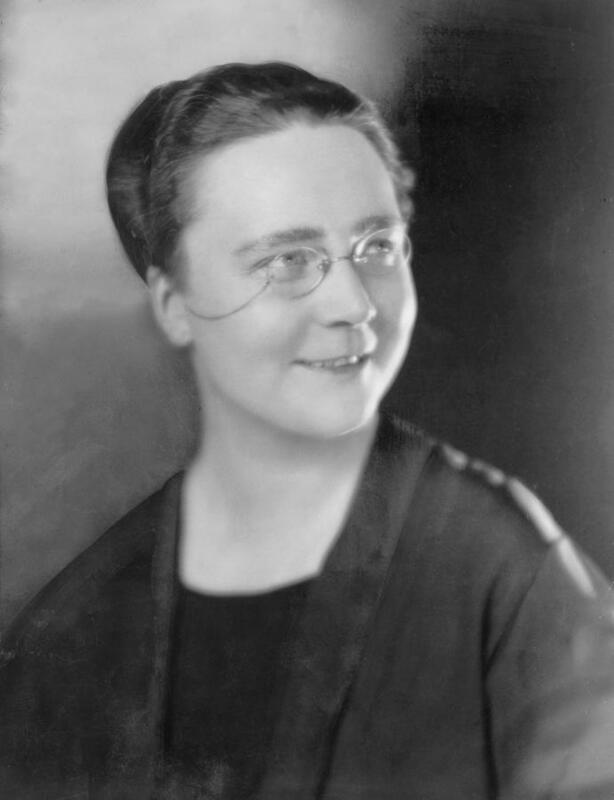 Dorothy L. Sayers is familiar to many mystery readers as the creator of amateur sleuth Lord Peter Wimsey. 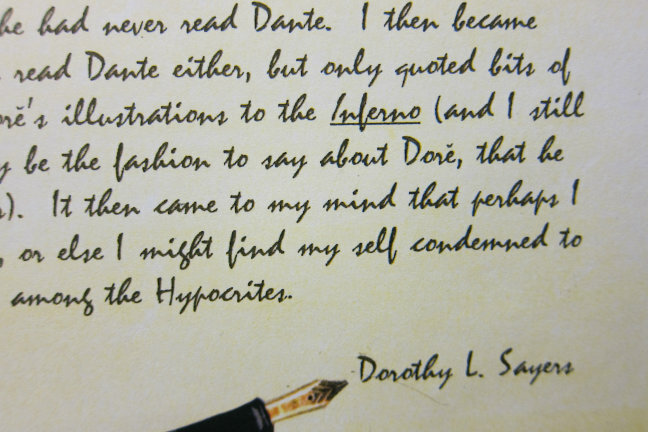 Her translation of Dante’s Divine Comedy is considered one of the best. As a woman in those days, she was not admitted to the exclusively male ranks of The Inklings, although she was friends with C.S. Lewis and Charles Williams. She, like Lewis, and Chesterton, was a “lay theologian” and wrote Christian non-fiction, The Mind of the Maker being the most notable example. 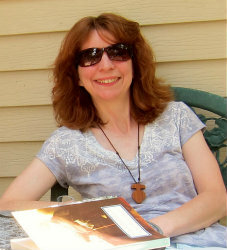 Her essay “The Lost Tools of Learning” serves as a manifesto for the classical education and home-schooling movements. 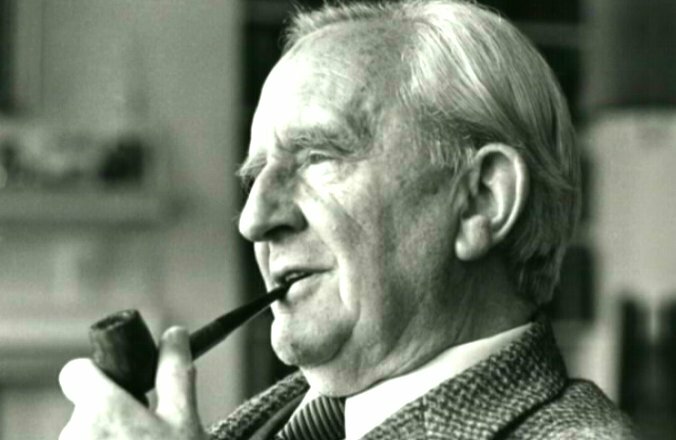 With the publication of The Hobbit and The Lord of the Rings, Tolkien might be single-handedly responsible for the entire genre of modern fantasy literature–or at least its 20th-century revival. He was a linguist, a philologist, and a professor at Oxford University. He worked on his magnum opus on and off for decades. 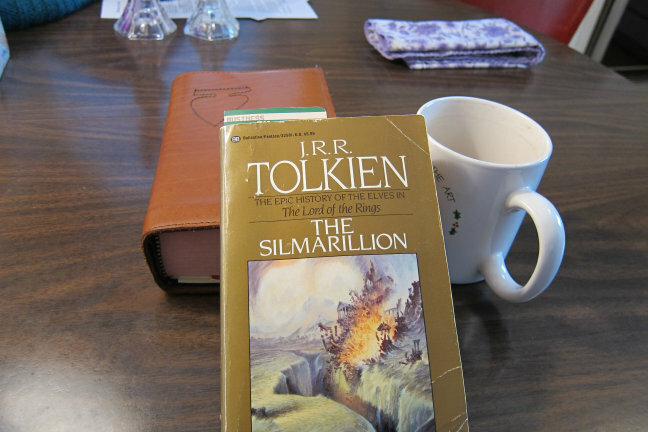 The Silmarillion was published after his death (and we owe his youngest son Christopher a great debt for all the work he did compiling his father’s piles and piles of notes, fragments, and stories, some finished and some unfinished, into publishable form.) What I find interesting about Tolkien is that he did not set out to be a fiction author, but he created Elf languages just for fun and then constructed a fictional world to explain the development of the languages. As an exercise in world-building, Middle-Earth is an incredible achievement. 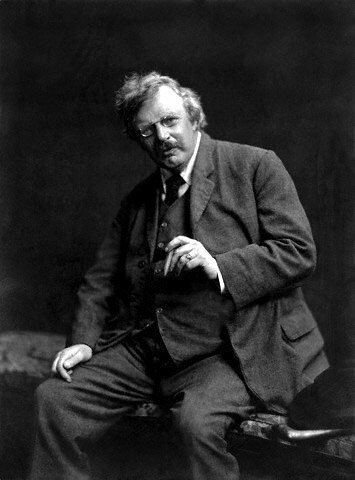 Williams made his living as an editor at Oxford University Press, but his real profession–his true vocation, perhaps–was scholar and author. He was a “lay academic:” he wrote, published and lectured on scholarly topics even though he lacked a university degree. 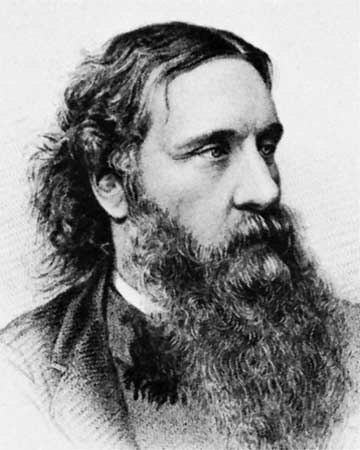 He was also an accomplished poet and author of “supernatural thrillers” (The Place of the Lion, War in Heaven, Descent Into Hell, others). And, like Lewis, Chesterton, and Sayers, he was a “lay theologian:” Descent of the Dove: A History of the Holy Spirit in the Church and He Came Down From Heaven. The Marion E. Wade Center An excellent and absorbing website. For each author, they have a “Where to Begin Reading” section, which is nice because some of the authors a bit obscure, and some are so prolific one hardly knows what to read first. The links I’ve provided below are not exhaustive, but they’ll get you started. Into the Wardrobe: A C.S. Lewis Website C.S. Lewis’s stepson Douglas Gresham has written an introduction to this site. “A Literary Pilgrimage” An article I wrote for the National Catholic Register. “Things Altogether Unexpected” a video produced by the Wade Center in 2012 to commemorate the 75th anniversary of The Hobbit. 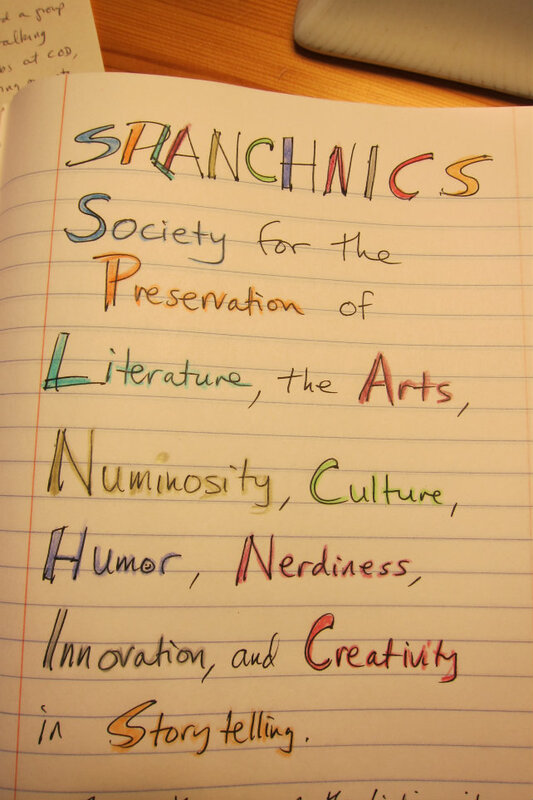 The use of the word “splanchnic” as an anagram name for a club is not original with me. 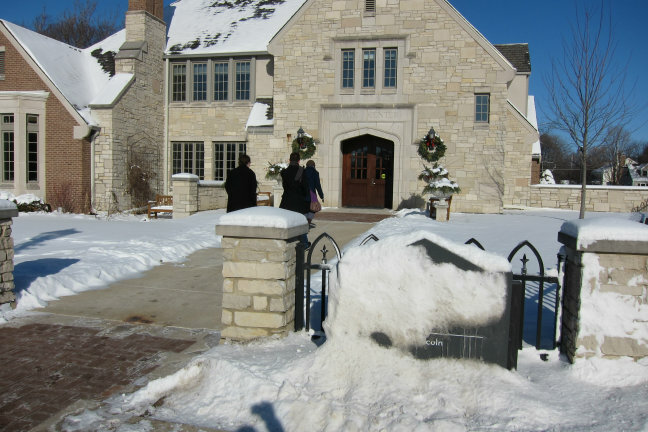 It was the name chosen in the 1980s by a literary society under the sponsorship of Dr. U. Milo Kaufman, professor of English at the University of Illinois at Urbana-Champaign. They came across the word “splanchnic” during a game of Dictionary and it just snowballed from there. (“Splanchnic” is a real word — it refers to a major artery and vein in the body that bring blood to and from the intestines.) Yes, I was a member, but I joined the group after they had already chosen the name. I took two classes from Dr. Kaufman: Science Fiction and The Literature of Fantasy. They were two of my favorite college courses ever. I still have my notes.